Cleaning the grates on an old stove (or even a new one) can be difficult depending on the extent the grime, dirt, and debris. The method you use for cleaning may depend on various factors or personal preference. Scrubbing is one method you may use as a way to clean stove grates. However, a better option is to clean stove grates with ammonia. 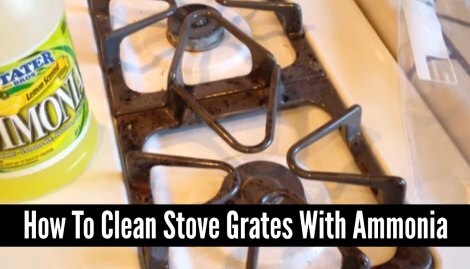 The ability to clean stove grates with ammonia is a great alternative to soaking grates in soapy water to prepare for scrubbing. Ammonia contains compounds that will eat away any caked-on oil which has been accumulating over time. However, there are a few precautions that need to be taken. A no-scrubbing method is a great way to clean old stove grates. If you come across any old stove with grates that have not been cleaned in years, then you can easily clean stove grates with ammonia. Just remember, this is a task that will need to be done in a well-ventilated area.